The Palazzo del Vescovado, or former bishop’s palace, dates back to the reign of Pope Benedict VII, who gave orders for the building to be erected in 977 next to the church of Santa Maria Prisca. It is thought that the right hand door of the Duomo, known also as Porta Soliana, was once the entrance to this magnificent building. Over the centuries the palace was enriched and sumptuously decorated by a succession of popes, cardinals and bishops. 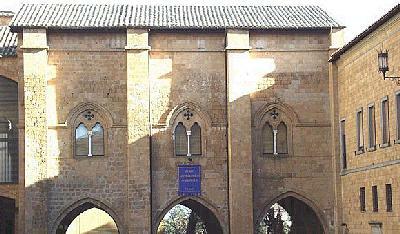 The interior contains a chapel with acute arches, still visible in part, while the exterior bifores of the original building are still visible from the square, along with the fine ogival trifore window near the cathedral itself. The rear façade of the building also contains magnificent windows that look onto the palace kitchen garden, in Via Cesare Nebbia. The fine decorative architectural details such as the capitols testify to the grand scale of the building and to the high artistic standards maintained in Orvieto in the second half of the 13th century. Part of the palazzo houses the Museo Archeologico Nazionale, which contains the interesting Golini I and II tombs dating from the 4th century BC.